"Tâte le sol" [tests the ground] suggests "doubt or uncertainty" which did not exist in the first version, "touche le sol" [touches the ground]. "Route" [way], a monosyllabic word, is replaced by a two syllable word, "racine" [root] (also beginning with the letter "r"). Both "racine" and "le sol" allude to man's primordial roots. "Avant" [before] is replaced with two words: an adverb of time, "puis" and the third person singular verb, "entreprend" [undertake, start]. Even though the syntactic parallel between "avant d'y prendre route" in the third line and "avant sa marche oblique" in the seventh line no longer exists, the choice of "entreprend" keeps a syntactic parallel between the verbs in these two lines: "prendre racine" and "entreprend sa marche oblique." Both possessive adjectives, "leur" [their] are replaced by the preposition, "vers" [toward] and the definite article, "les" or le" [the]. An anaphoric use of this preposition, "vers" becomes apparent in the last three lines of the poem. "Vers" also is a noun in French which means "a line of verse." 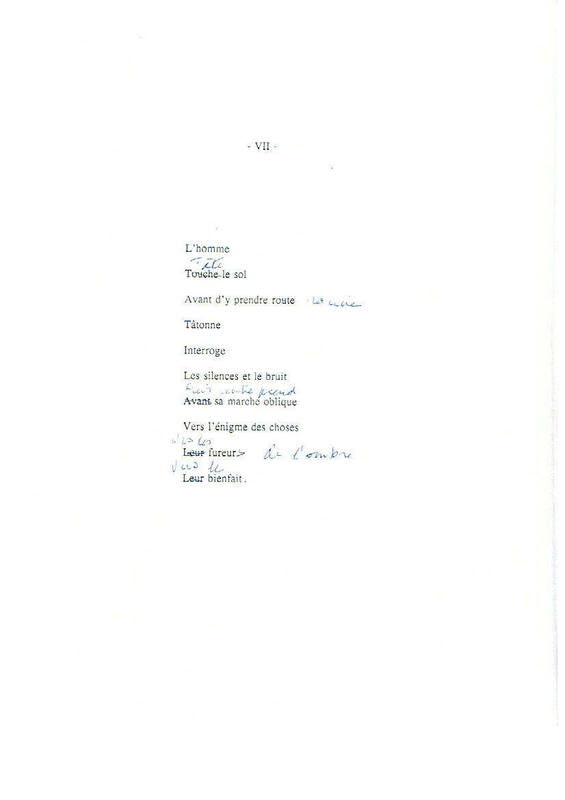 "Faire des vers" means to "write poetry." Click here to see original document.